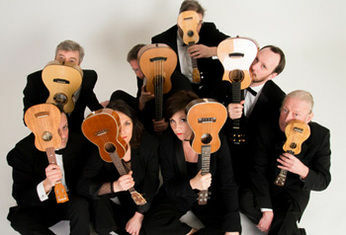 The Ukulele Orchestra of Great Britain is a group of all-singing, all-strumming Ukulele players, using instruments bought with loose change, they passionately believes that all genres of music are available for reinterpretation, as long as they are played on the Ukulele! A concert by the Ukulele Orchestra is a funny, virtuosic, twanging, awesome, foot-stomping obituary of rock-n-roll and melodious light entertainment featuring only the “bonsai guitar” and a menagerie of voices in a collision of post-punk performance and toe-tapping oldies. of whistling). Going from Tchaikovsky to Nirvana via Otis Redding and Spaghetti Western soundtracks, the Orchestra takes you on a “world tour with only hand luggage” and gives you “One Plucking Thing After Another”.